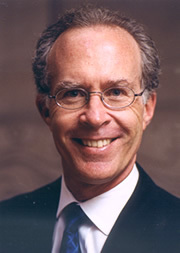 Thomas H. Jackson, president of the University of Rochester from 1994 to 2005, holds faculty positions in the William E. Simon School of Business Administration and in the University's Department of Political Science. Before he became Rochester's ninth president, Jackson was vice president and provost of the University of Virginia, which he first joined in 1988 as dean of Virginia's School of Law. he had been professor of law at Harvard from 1986 to 1988 and served on the Stanford University Faculty from 1977 to 1986. A 1972 graduate of Williams College, Jackson earned his law degree from Yale in 1975. He first clerked for US District Court Judge Marvin E. Frankel in New York in 1975-76, and then for Supreme Court Justice (and, later, Chief Justice) William H. Rehnquist in 1976-77. Jackson is the author of bankruptcy and commercial law texts used in law schools across the country and served as Special Master for the US Supreme Court in a dispute involving every state in the country over the disposition of unclaimed dividends held by brokerage houses.